On the backroad between Bucksburn and Kingswells, on the outskirts of Aberdeen is Newhills Old Parish Church and Cemetery. Passing it on many occasions, I often noticed the sign on the gate signifying that the site contained War Graves. This never failed to pique my interest, and so one day I finally took the opportunity to venture inside and have a look around. 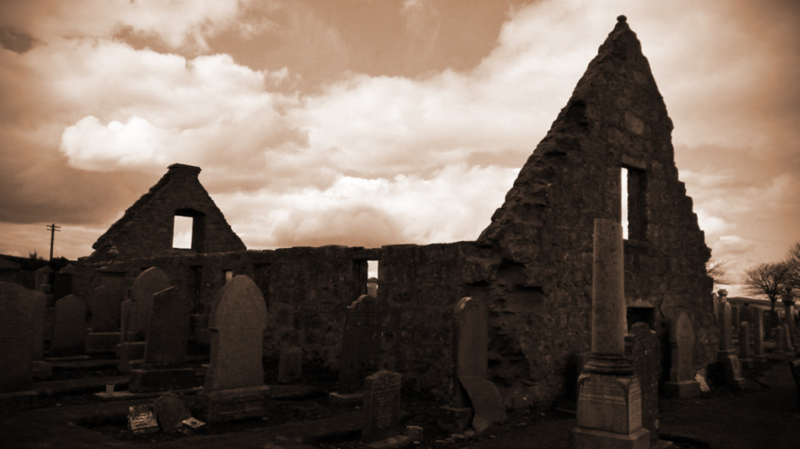 The church is nothing but a rectangular ruin, with its walls looming precariously above you. The gravestones are crammed together with no sign of any natural footpath for walking amongst them, so at times it can actually feel a bit disrespectful as if you are walking across graves. The main entrance door to the church is probably only five-foot-high, meaning I had to duck to go through it. The building does not appear to have sunk, but the surrounding earth being dug over the years has raised the ground level with many burials against the exterior wall. Even the inside of the church had been requisitioned to provide burial space. 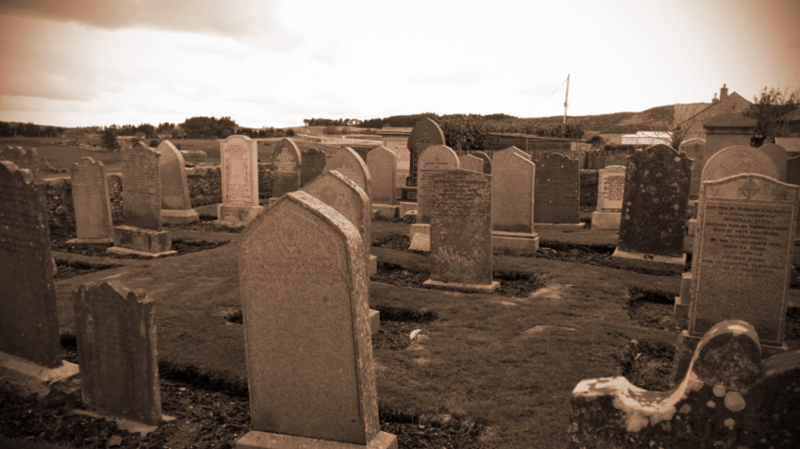 The cramped ‘older’ graveyard was in stark contrast to the adjoining modern one with its wide paths for walking between the lines of granite, marble and sandstone slabs laid out in neat rows. There is open farmland surrounding the church. It was built as a chapel of ease (an additional church built to serve a growing or remote congregation) in 1663, but became the parish church of the newly created Newhills Parish three years later. It was in use until a new, much larger church was built downhill to the east during 1830. It was not long before I came across a military headstone and found myself looking down at the last resting place of D. Merchant of the Royal Engineers who died on 3rd April 1919, five months, almost to the day since the First World War ended. For many people this would be just another headstone in a forest of them, but to me each headstone represents a person and a story. Not to mention a chance to investigate and give the name on the headstone a little bit of life once again. I tend to gravitate towards military headstones for the simple fact that it is an area that interests me, and it is also a lot easier to find the history behind the name due to the military records that are out there. 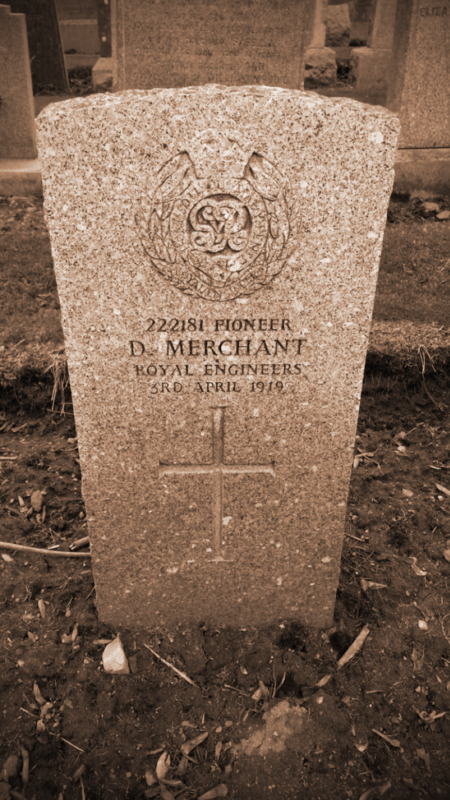 When I got home I fired up the computer to see if I could find out about D. Merchant (David), but the Commonwealth War Graves Commission site was pretty sparse for my needs as it offered only what was detailed on the headstone, with a few extra bits of information. 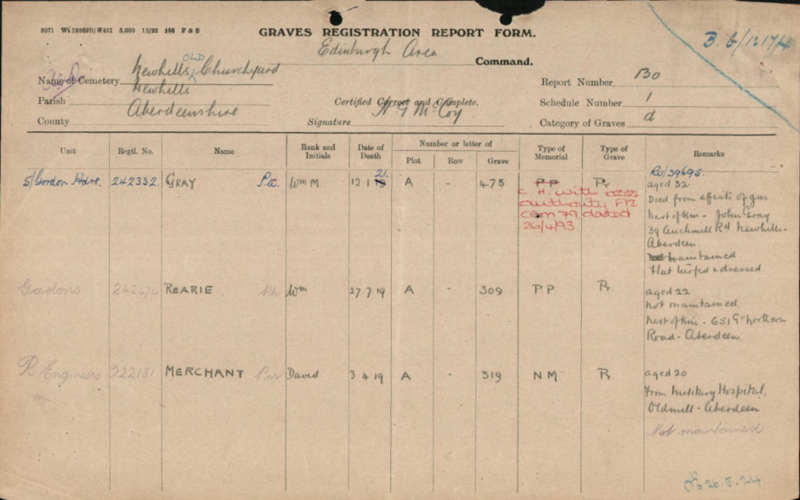 I also found his Graves Registration Report Form which provided a little bit more information as can be seen below. 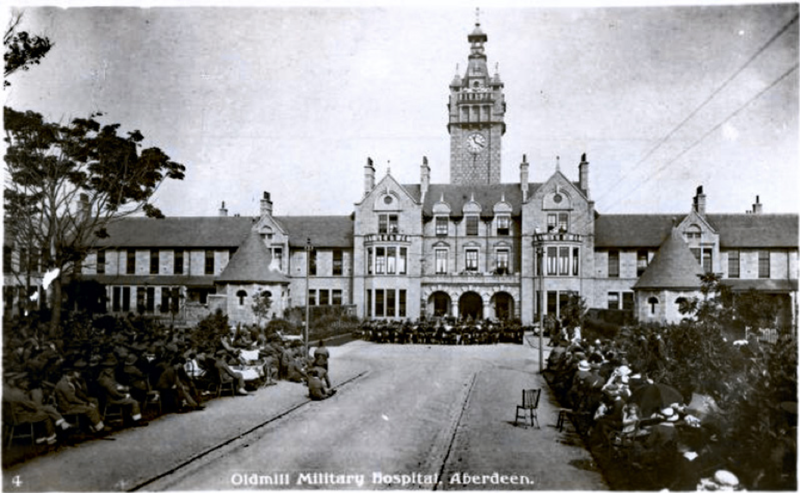 The last entry on the form is for David, he was only twenty years old when he died, coming from from Oldmill Military Hospital, Aberdeen. 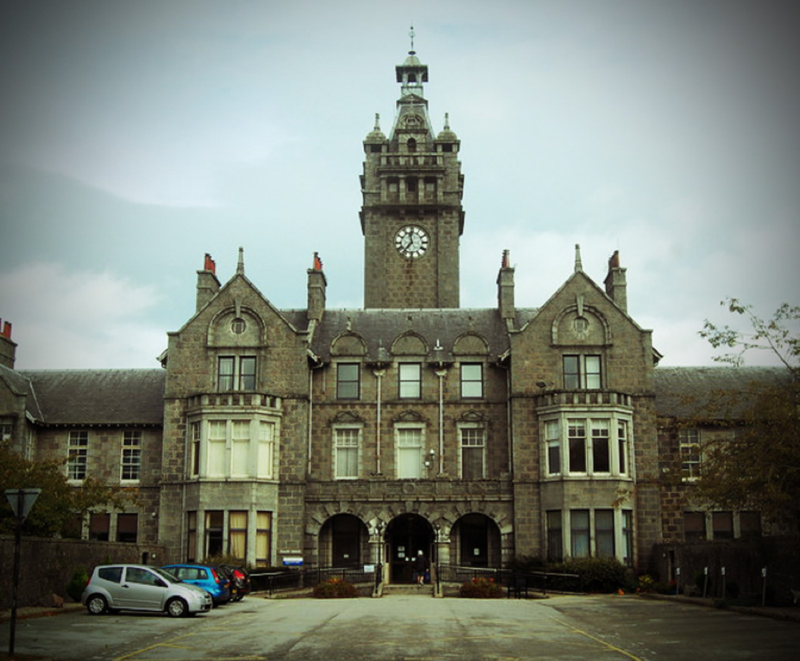 This is now Woodend Hospital pictured below as it looks today. But in all fairness, it has not changed much from the days of the First World War, when it was requisitioned by the military from 24th May 1915 to 1st June 1919, ceasing military assistance just two months after David passed away. My next port of call for information was the Imperial War Museum: Lives of the First World War website which did not really cast any light on the circumstances surrounding David’s death or his service. It did however provide information which revealed his middle name was Walker. So, what do we know about David Walker Merchant? He was born during 1899, joined the Royal Engineers at some point during World War One and was based at the Signals Service Training Centre (SSTC) at Bedford. The role of the Bedford (SSTC) was to train recruits and had been since 1916, so with that evidence alone it is a possibility that David never did see active service during World War One and illness or an accident was the cause of his death on the 3rd April 1919 at the tender age of twenty years old. I will be revisiting Newhills Cemetery in the future to investigate some of the other military graves contained within its walls, but thank you for reading and remembering. UPDATE: 3rd April 2018, ninety-nine years to the day since David passed away, I accessed the Scotland's People website and was able to purchase a copy of David's death certificate. In doing so, I discovered that the cause of death for David was a malignant stomach tumour. In a sense I was glad to have answered the question about what caused his death, but more than that I was left feeling profoundly sad that David's life had been so tragically cut short.